Exciting life in the country! 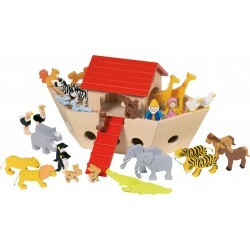 With this farm from our small foot world playworld, kids can pretend a..
Sound the alarm! We've got a call! This fire station from our small foot world playworlds is sure to..
Noah's Ark In rows of two the animals, Noah and wife walk into the Arc. The detachable house makes p.. Attention all buccaneers! Here is the new floating pirate place of activity! This pirate ship is app.. There's really something happening here! Action is guaranteed in this police station from our small ..